This is an excerpt of a 2010 CNN interview with Cato Institute’s Director of Center for the Study of Science, Patrick Michaels. The interview reflects his admission that roughly 40% of his research funding came from the oil industry. Michaels: I’m advocating for efficiency. Zakaria: Right. But people say that you’re advocating also for the current petroleum based industry to stand back, to stay as it is, and that a lot of your research is funded by these industries. Zakaria: Is your research funded by these industries? 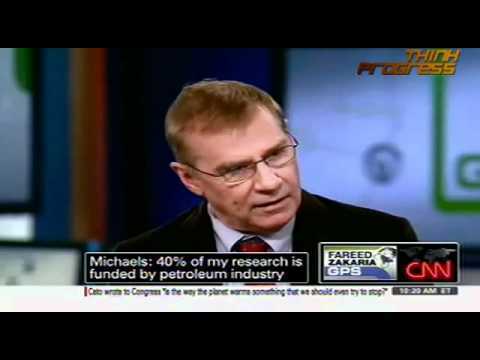 Zakaria: Can I ask you what percentage of your work is funded by the petroleum industry? Michaels: I don’t know. 40%? I don’t know.